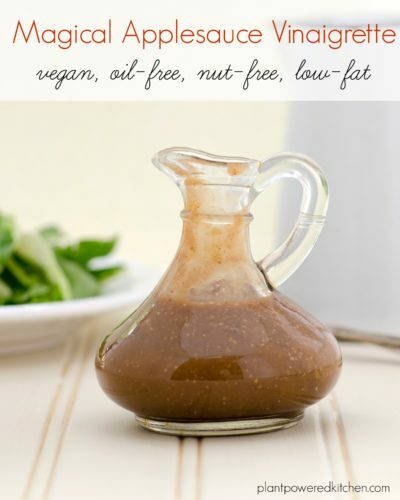 Oil-Free Vegan Salad Dressing: Magical Applesauce Vinaigrette! Update: My OIL-FREE salad dressings now here! Cooking and baking are sometimes described as science… but I like to think of it more like magic. Because sometimes an idea unfolds and is realized in food form with a way that is almost mysterious, yet very exciting! This week this magic happened with an idea for an oil-free salad dressing. I actually had this concept for a fat-free vinaigrette years ago, when I was writing Vive le Vegan. I toyed with it, but left it behind at the time. As recipe developers, we sometimes do this. Either the notion becomes further developed down the road as our cooking evolves, or it never materialized. using applesauce in an oil-free salad dressing. Sounds a little strange at first, right? But, think about the qualities of applesauce. It has viscosity and moisture (the very things that help replace fat in baking) so why not aid a vinaigrette as well? Initially the combination didn’t quite come together for me in terms of flavor balance. After a few rounds of testing this week – ta-dah! The magic happened. The applesauce blends and helps emulsify the other ingredients so that you have a thicker, more rich and full-bodied textured dressing. This dressing uses applesauce to emulsify the ingredients and produce a surprisingly thick oil-free salad dressing! Try it as is first, and then play with some of the seasonings to your own preferences. Using an immersion blender and deep cup (if using a blender, you may need to double the batch for enough blending volume), combine all ingredients, whizzing through until very smooth. Taste, and if you’d like a little sweeter add another teaspoon or so of maple syrup. Season to taste with additional salt and pepper as well. If you’d like a thinner dressing, simply add a couple of teaspoons of water and blend through again. What are your favorite vinaigrette and salad dressing ingredients? Note: This oil-free salad dressing recipe is now in Plant-Powered Families. Wow! Just…WOW! I made this for a beet, apple, walnut salad with greens. OMG! It’s perfect! I will be using this on everything from now on. I would have never thought, “applesauce, let’s put applesauce in the dressing.” But it works wonderfully. If anybody is skeptical, just try it. You’ll be amazed! Yay! Just wonderful to read, thank you Lisa. Sometimes odd combinations can work magically! What is the calorie count on this recipe? I have to watch my calorie intake carefully. My hubby and I are on the Engine 2 – 28 day challenge and finding an oil free dressing was soooo difficult! Until tonight. I made eggplant lasagna rolls and while they were baking a searched for an easy, quick dressing to throw together for a salad. Find this and although I would have normally questioned the ingredients, I just went for it, substituting where I had to (no dijon mustard so I used regular yellow…, no miso so I just omitted it) After not having a salad for 2 1/2 weeks, I was happy as ever to have a salad AND that the dressing was yummy!! Hubby wouldn’t try it so I devoured the salad, commenting as I ate. When I had nothing but a bit of dressing left in the bowl, he dipped his finger into it and then again and again, finally stating “okay, I could eat that, did you make more?” Yay! E2 win, hubby win, health win!!! IF I MADE A DOUBLE OR TRIPLE BATCH, HOW LONG WILL THIS STAY GOOD IN THE FRIDGE? It keeps well up to a week or so. Thank you, thank you Dreena for this no-oil, no-nut salad dressing. Since I follow Dr. Esselstyn’s plant “perfect” eating for heart health, it is wonderful to have this recipe. So many times I’m stymied from using no-oil recipes because of the inclusion of nuts or avocado or other high fat whole foods. You get the gold medal for this one!! Late to the table on this one, decided to make after recent post on Happy Healthy Librarian facebook page. This is a fabulous, OIL-FREE salad dressing! Great texture and flavors: savory, tangy, sweet, salty…versatile and so easy. Appreciate your work. THANK YOU! Late to the table on this one, decided to try after featured on the Happy Healthy Librarian facebook page. SO fabulous – delicious combo of flavors, perfect texture, versatile. Thankful for NO-OIL dressings and most appreciative of your work. THANK YOU! Where can I find the miso? Would the recipe work without it? Miso is available in many grocery stores (with some of the refrigerated health food items like non-dairy milks and flax meal), and in health food/whole foods stores. I really like chickpea miso, but you can use any other mild miso. It had never dawned on me that oil free salad dressings were a thing until I was researching some new yummy vegan dressings. I came across your site and am totally hooked. I made this dressing the same day and it is AMAZING. My boyfriend loves it and is now disappointed when we don’t have salad with dinner!! It’s the only dressing I’ve made in my house the last month and will probably continue to be for the next while, Thank You! PS Trader Joes sells a Pomegranate vinaigrette that is awesome and works really well as a fun substitution. It allows you to use less maple syrup since the Pomegranate is already a little naturally sweet. Delicious dressing! I’m using it on salad, potatoes, and veggies too. I normally only like creamy nut based dressing but they are so high in calories I try not to use them very often. This is perfect, thanks Dreena! Glad to hear it, thanks Laura! Just found your site, and am so excited about trying this vinaigrette. Do you have a printer friendly link that I’m missing? I just made this for lunch and it was delicious! The applesauce really stands in for oil well. I left out the mustard because I don’t like it (even if I can’t taste it!) and am out of cinnamon so that was missing too. Very good anyway. I want to experiment with other dressings now! I think an Asian dressing would lend itself well to the applesauce method. This dressing is so good! Amazing flavors. It would make an amazing marinade too! i just made this dressing – it is so tasty and amazing – thank you!! Wonderful to know, thank you Sharon! I’m so excited to try this! I’m a long time balsamic fanatic (and Italiophile; brought BV home from Modena 🙂 and have often enjoyed it with strawberries to the delight & surprise of uninitiated friends. This is also timely for me as just recently I’ve been researching oil-free vinegrette options for myself and for a friend who needs a healthier option. 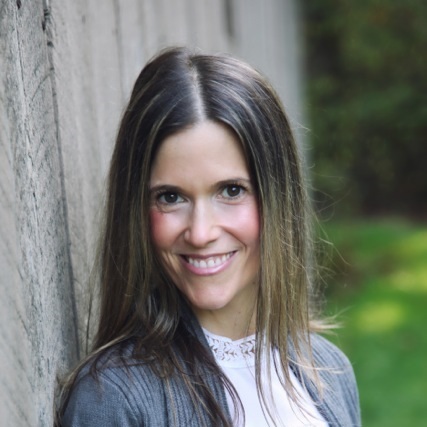 Thanks, Dreena – you da bomb!! This vinaigrette is fabulous! I have made it twice already and the second time I made a double-batch. I’ve experimented with adding some stevia in place of some of the maple syrup, and I’ve also reduced the salt and the dressing still tastes amazing! I found that the recipe not doubled makes about enough for 4 super large salads (at least for me!). For those of you with salt or sugar restrictions, just play around with until you get a combo that suits you. Some misos are also saltier than others, so you might want to keep that in mind if reducing the salt. Oh, I also used a whole grain mustard that adds a subtle spiciness. So this dressing is sweet, salty, tangy, savory and just delicious! I love the combo of cinnamon and cumin and have toyed with the idea of throwing in a bit of curry powder. I might have to try that next time! Thanks for a genius recipe, Dreena! Could you share how much and what kind of stevia you used in this recipe? I prefer to use maple syrup, but if you want to use stevia, add just a pinch or two to taste, adjusting until you like the flavor. Oh my. I just made this dressing and put it on my fresh tomato, roasted beet, and strawberry salad. I am deeply and madly in love. Thank you a million times! You’re a million times welcome Jody!! I’m delighted you loved it so much, and your salad combo sounds dynamite!!! This salad is beautiful!!! Do you cook or steam the zucchini ribbons? This dressing looks so delicious! Yum!! This recipe sounds good- but I have a question. I do not like any kind of mustard. If I leave it out, will the dressing still taste good? I think even I would go for honey than maple syrup. Let me try it and then get back to you. FYI – I put this recipe into my food program, and I’m wondering how many servings this makes? In the total recipe there is 888mg of sodium (more than half of the daily recommended amount) without adding additional salt to taste as you suggest. There is also 25 g of sugar and 30 g carbohydrate (which is equal to 2 servings of fruit). The food program is handy to check out the nutrition info. For those on a plant strong vegan diet because of health reasons, like heart disease or diabetes, this recipe would have to serve about 10 people to be acceptable. Certainly you can reduce the salt – or omit the miso – if you like. You can also reduce the sweetener somewhat, but at some point the reduction of seasoning and sweetener really sacrifices flavor. I use my batch over about a week’s worth of salads for my husband and I, just a little drizzle works well (maybe 2-3 tsp per portion). I find if you toss it through the salad, a little goes a lot further as well (rather than having it poured over the top). That way you keep more of the flavor and enjoy your salad that much more! I appreciate your information for people with health issues. this sounds wonderful, do you think I can use agave instead of the maple syrup? Do you have any other thoughts about Agave nectar, good bad or otherwise? I heard that it is the worst sweetner and that it is made with corn syrup. My bottle is organic Agave and has no ingredient list, just states Organic Agave Nectar derived from the plant. Hi Tina, certainly you can. I do often prefer maple syrup mostly for the flavor it imparts (including in this dressing), and also just how wonderful and versatile it is as a natural sweetener. I do use agave at times, if I don’t want the pronounced maple flavor – but will opt for maple syrup when I can. There isn’t corn syrup in agave nectar, but you may be thinking about corn syrup because comparisons have been made between the fructose content in agave vs corn syrup. Agave nectar has a lower glycemic index than other sweeteners, but some suggest that the higher fructose level makes it less of a healthy sweetener than originally thought. For me, the information is not entirely clear, so I use it more sparingly and choose maple syrup, or coconut sugar, or dates, etc, as sweetener options. That help any? I don’t like miso. Is something else I can substitute? Mare, you can omit it and add extra salt. The miso flavor doesn’t come through too prominently in this dressing, but if you want to omit it then bump up the salt to about 1/2 tsp, and you can always adjust more to taste if you like. Thank you! I can’t wait to try this one! I believe I saw a recipe of your that was a miso salad dressing…now I can’t find it. I have your book Let them Eat Vegan and Eat Drink and be Vegan. Looked in both but I cant seem to find it. Maybe it was a miso sauce…not sure. Do you have a miso dressing that I am referring to? Tiffany, I did do a miso gravy (very tangy) in my first cookbook ‘The Everyday Vegan’… but I also did and Orange Miso Vinaigrette (fat-free) for the PCRM kickstart last April – do you recall which of the two it was? how long can this keep in refrigerator? Hi Annette, with the vinegar in the dressing it will keep well for at least a week – probably two. It’s not a really large batch, so you would probably use it in that time. This was awesome! Thanks for the great recipe! Do you think I could substitute raspberry vinegar to make raspberry vinegrette? You’re welcome Kaitlyn. 🙂 And, I think the raspberry vinegar would be a delicious substitute! Definitely a recipe you can play with, and you might want to use some raspberry, some balsamic, etc. Have fun! I love to use an over ripe pear with balsamic. I used to hate having fruit get overly ripe but now things like over ripe bananas, pears and the like are sought after commodities. Sounds good, always looking for good dressing. 🙂 Do you ever use chia gel? I like to use that in dressings. What a brilliant idea! I’m going to have to try this. This looks so good. I will try it today. A big THANK-YOU to you! This sounds amazing and i can’t wait to try it but… excuse me for sounding dumb, but a Vitamix would count as an immersion blender right? Dreena, watched your video with the immersion blender. Thanks because I did not even know what it was. Will buy one from BBB this weekend. I have several salsa jars I think they will be a perfect fit also. Thanks again for sharing. Oh cool! I sometimes assume that the term is well-known, you’ve reminded me that it’s not always (just to me as I’m a bit of a food geek). 😉 You’re welcome Carla, and I think you’ll get good use with it… my very fave tool for pureeing soups! That sounds great – my 2 favorite basalmics are a pomagranite infused and a white pear infused basalmic – that way I don’t add any extra sugar. They are amazing! Dreena- I believe you are a genius. Wow, that looks so…. good. Do you think I could replace the maple syrup with raw honey? Hi Darlene, yes, I think it would work fine. I haven’t tested it with honey, but in this quantity the sub should be fine (you may want more/less to taste). Can’t wait to try this! It sounds delish!